Overwatch’s newest hero is a melee DPS character known as Doomfist. He’s a Nigerian martial arts master that has been cybernetically enhanced with a massive robotic fist. While he is only available on the game’s PTR at the moment, it is clear Doomfist has the potential to make a huge impact on the game as a whole. 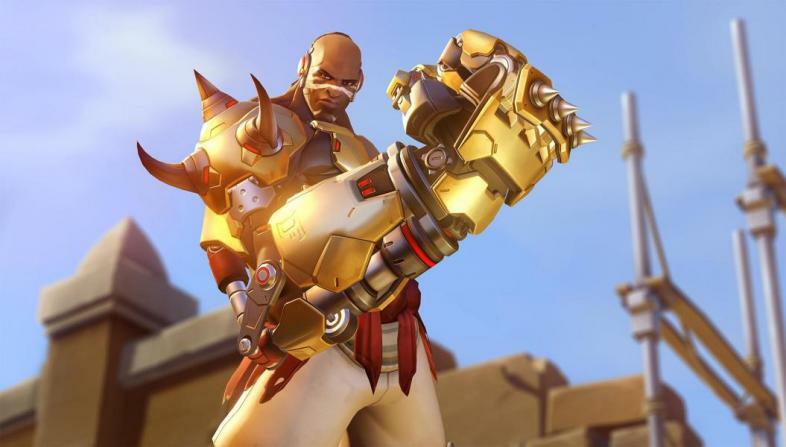 Unlike most of the other offense characters in the Overwatch, the bulk of Doomfist’s damage will come from his abilities. Therefore, a player that has a solid understanding of ability management and a feel for Doomfist’s cooldowns will get the maximum impact out of his fearsome fisticuffs. Hand Cannon – Doomfist shoots shotgun-like projectiles directly out of his knuckles. The weapon only has a four-bullet capacity, but reloads automatically over time. It does 11 damage per pellet, with a six-pellet shot. For a shotgun, that is not a great deal of damage, but his hand cannon should not be underestimated. It can do a ton of damage to tanks and is a dependable way to take down low-health heroes. Rocket Punch – The move that defines Doomfist. With Rocket Punch, Doofist lunges forward up to 23 meters depending on how long he charges it. The initial impact will cause 49-100 damage to an enemy, and if he is able to send them into a wall an additional 49-100 damage is done. Rocket Punch has a short 4 second cooldown, so it can also be used to move quickly across the map. Rising Uppercut – Doomfist punches an enemy high into the air. Its primary purpose is to leave low-mobility heroes in a vulnerable state, allowing Doomfist and his allies to quickly finish them off. It is also great to displace key enemy heroes, like a Reinhardt shielding his team. Like Rocket Punch, Rising Uppercut can also function as a movement ability, allowing Doomfist to access high-ground on the map. Seismic Slam – Doomfist launches forward and slams his fist into the ground, causing affected enemies to defy physics and be pulled toward him. While it doesn’t do a great deal of damage, it is a great initiation move for Doomfist. It can be used to set-up an enemy for a deadly Rocket Punch or Rising Uppercut. The Best Defense – As he deals damage with his abilities, Doomfist generates shields. Meteor Strike – Doomfist’s ultimate sends him high into the air and back down again unleashing 300 damage to targets in the center of his strike. That’s enough damage to take out over half of the heroes in Overwatch. The ability isn’t limited to outdoor sections of the game’s maps, but can also be used inside. It’s great for taking out slow heroes and scaring enemies away from the objective. Doomfist’s abilities scream out to be used as combos, and there are a number of different ways to combine them. The deadliest combo is to land a Seismic Slam on a couple of enemies (but NOT the entire enemy team) to generate a solid amount of shielding, then single one out and uppercut them into the air, and finish them off with a Rocket Punch. Try to aim for enemies with low health and mobility to ensure they won’t get away before you kill them. These will also be your major targets when using Doomfist’s ultimate. The enemy cannot see where you are aiming until you confirm where you want to land, so a slow hero won’t be able to get away if you line it up correctly. As players master Doomfist’s abilities, a number of different playstyles will be utilized for different situations and team comps. So far, two distinct playstyles have risen to the top as the most popular among players. For a DPS hero, Doomfist has a huge amount of health, giving him a good amount of staying power in the midst of battle. Players can take advantage of this by using him almost as you would Winston. When an opening appears, charge into and disrupt the enemy team, kill what you can without overstaying your welcome, and Rocket Punch your way back to the comfort of your healers. This is a risky playstyle that I’m sure will cause a lot of grief among teammates with an overzealous Doomfist that charges into the entire enemy team at once with no backup, but in the right hands it can be devastating. But he can also be utilized as more of an assassin hero that singles out one enemy and waits for his opportunity to pounce. If you can land all of his abilities on a single hero, there aren’t many that could come out alive, which makes Doomfist amazing at taking out key targets on the enemy team. This playstyle takes more patience, but can make a huge impact on the outcome of a fight. Mercy - Mercy mains everywhere will rue the day Blizzard introduced him to the game. When attacked by other DPS heroes, Mercy is often able to escape by flying away, but Doomfist can Rocket Punch after her, and take her down early in the fight. Zenyatta – Zen is slow and has a low health pool, making him easy for Doomfist to take out. Ana – Like Zen, she is slow and has low health—although her sleep dart could cause some problems for Doomfist. Reinhardt – Rein is one of the slowest characters in the game, making him easy prey for Doomfist. Rocket Punch can also stop Reinhardt’s charge in its tracks, and has a much shorter cooldown. D.VA – While she does have great mobility and could escape him fairly easily, if her rocket boost is on cooldown, Doomfist can take her mech out easily, since all of his abilities go through her Defense Matrix. Pharah – Her range and near-impossibility for Doomfist to reach make her extremely good against him. Her knockback ability can also disrupt his Rocket Punch and Seismic Slam. Soldier: 76 – Doomfist is dead if Soldier can shoot him from a safe distance. Hanzo – His range and wall-climb will make him hard for Doomfist to pin down. Tracer – She can out-maneuver Doomfist and Recall any damage he manages to land. Widowmaker – Again, ranged attacks are devastating to Doomfist, and no one has more range than Widow. Lucio – He can easily get away from Doomfist and disrupt his abilities with his boop. Orisa - Literally created to fight him according to the game’s lore. Orisa’s graviton orb can throw off a charging Doomfist, and fortify makes her invulnerable to most of his abilities. Sombra – A hacked Doomfist is incredibly vulnerable and easy to take down. The hype around Doomfist was meme-status massive. To be honest, I was preparing myself for inevitable disappointment. But Blizzard really delivered on this awesome hero, and the game is going to be quite different when he officially goes live.